Prophets enjoying fellowship prior to the annual PGA President’s Dinner. Pictured left to right are Prophets Dave Griswold, PM, PP; Pro. David Ingalls, PM, President of the PGA; Mark McCombs, Grand Master of Ceremonies; Seth Anthony, First Vice President of the PGA; and David Shapter, PM, former member of the Humanitarian Foundation Board of Trustees. On the weekend of October 4 & 5, 2013, Pro. Seth Anthony, Past Monarch of Ubar Grotto, attended the annual meeting of the Pennsylvania Grotto Association held at Erepa Grotto in Erie, PA, home of the then President of the PGA, Pro. David Griswold. Erepa is about as far away from the lands of Ubar as one can go while still being within the bounds of the Commonwealth, but Seth didn’t let the long distance deter him. Originally hailing from the Erie area, the trip also served as a time to visit with his family and Brothers from his home Masonic Lodge. Beginning on Friday, Prophets from all over the Realm gathered at the Saga Club, home of Erepa Grotto, located on Washington Ave. near 38th Street in Erie. The Grotto put on a steak fry for those in attendance and even had live musical entertainment for everyone’s enjoyment. The party lasted well into the evening, with all of the Prophets rekindling old friendships and starting new ones. Pro. Don Adams, Monarch of Erepa, and his lady Betty, were excellent hosts. Saturday began bright and early with a Memorial Service for departed Prophets and Ladies led by Pro. Robert Keas, Chaplain of the Pennsylvania Grotto Association. Each Grotto was given a special tribute in remembrance of its fallen members. Following the service, the business meeting of the PGA was held. Much time was spent discussing the changes pending in the PGA by-laws, which were finalized during this meeting. The officers for the ensuing year were also elected at this time. The meeting was closed with remarks from Pro. Mark McCombs, Grand Master of Ceremonies, representing Pro. Otto Thiergart, Grand Monarch. A catered luncheon was then held to wind down the morning, after which Prophets were encouraged to enjoy the Erie Bayfront and other sites until dinner time. The Presidents Banquet was held at the Saga Club that evening. After a fantastic meal, the crowd was treated to a show by the Erie Maennorchor Choristers, a singing club for men that is close to 70 years old. Two Prophets from Erepa Grotto are involved with this group and sang with them during the show. Finally, closing out the night, the annual installation of officers was held. Pro. David Ingalls, PM, of Kismet Grotto was installed as President; Ubar’s own Pro. Seth Anthony was installed as First Vice President; Pro. Ray Suarez, Ubar’s Supreme Council District Deputy, was elected Second Vice President but was not present to be installed; Pro. 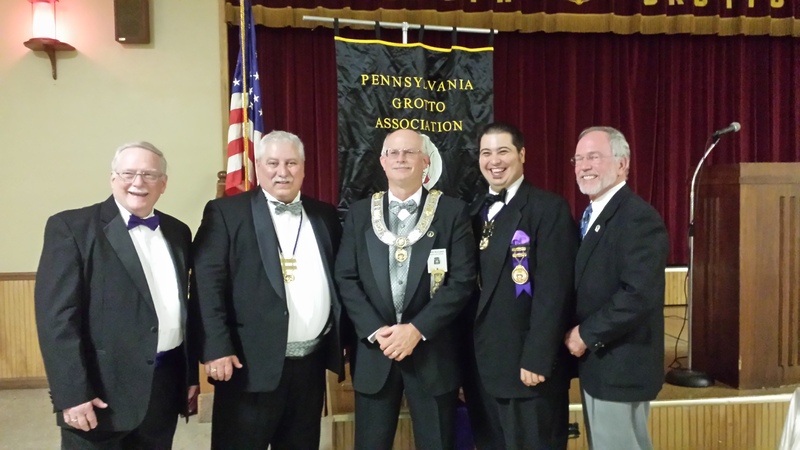 Russ Combs, Monarch of Delco Grotto, was installed as Third Vice President. Prophets Bob Lorenz, Jr., and Max Pokorski, both of Islam Grotto, retained their seats as Secretary and Treasurer, respectively. It was a great weekend of fun and fellowship and Ubar hopes to send a larger delegation to the next PGA meeting, to be held in April of 2014. Pro. Keas leads the service. The Altar for our departed Prophets. Pro. Anthony visits with Pro. McCombs. The fezzes of the First Vice President and the Chaplain. Pro. Anthony with Pro. McCombs prior to being installed. The Erie Maennerchor Choristers perform. Pro. Ingalls addresses the crowd following his installation. Pro. Anthony with Pro. McCombs after being installed.